Develop all Quartermaster AC/RC/NG individual training products, except as noted previously, in support of the Quartermaster General (QMG), Quartermaster School (QMS) and field units. QMTD consists of three branches: Aerial Delivery, Field Services and Subsistence Branch; Petroleum and Water Branch; and the Automated Logistics and Supply Branch. 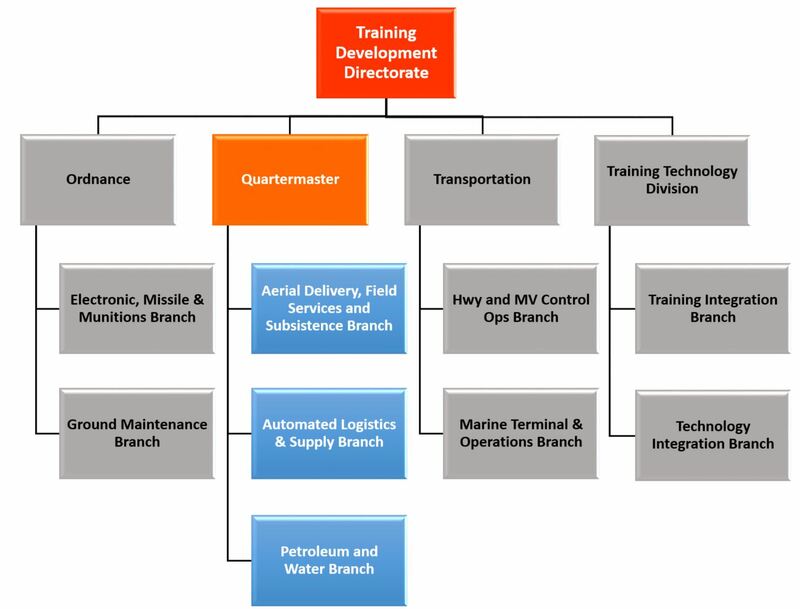 The Aerial Delivery and Liquid Logistics Branch consists of six sections which develop the training to educate the Warfighter Logistician to provide field shower, field laundry, fabric and light textile repair, tactical field exchange, provide purified water and high quality petroleum based products such as fuel and lubricants, to the force. This branch develops training for personnel in MOSs 92F, 92L, 92R, 92S, 92W and certain QM functional courses. The Automated Logistics, Supply and Subsistence Branch develops the training and doctrine materials required to educate the Warfighter Logistician in the skills needed to perform subsistence management, dining facility operations, requisition, storage and distribution of items to the force, such as repair parts, rations, water, petroleum, individual and organizational clothing and equipment, personal demand items, administrative supplies, unclassified maps, fortification and barrier material, as well as services, such as tactical field exchange, reclamation, salvage, and property disposal. This branch develops training for MOSs 92A, 92G and 92Y. (1) Coordinate training development priorities with the QMS. (2) Develop and field all training development products IAW TR 350-70 and CASCOM policy. (3) Develop training strategies to optimize training productivity and effectiveness. Coordinate with the TTD to ensure effective use of learning technologies in support of training strategies. (4) Provide developed training materials to respective institutions for review and validation of content and subject matter. (5) Conduct periodic IPRs with resident and Reserve training institutions to review course curriculum. (6) Conduct job and task analysis and task selection boards for each proponent course with appropriate agencies or training institutions. (7) Coordinate CAD and POI with training institutions to identify resource requirement for the SMDR and review of manpower processes for the QMS. (8) Update POIs as needed based on feedback from formal analysis, field reports, after action reviews, and training surveys administered by the L2/CTC for the QMS School. (9) Develop and manage POIs for the QMS. (10) Develop lesson plans for the QMS. (11) Maintain TRAS source documentation and instructional publications and resource trade-off documentation. (12) Participate in the proponent’s Institutional Training Management Board. (13) Prepare input to contract strategies, statements of work and related documents for individual training products; ensure that contractor-developed materials are in compliance with the terms of the contract. (14) Develop Enterprise Resource Planning (ERP) training products for institutional and operational Army use.